A strong wind had destroyed the metal roof on Mauricio and Tule’s home​,​ leaving their family without adequate protection. For years, Mauricio would not allow his family to attend church because he did not trust Christians,​ and​ so when a local pastor approached ​his​ family ​and volunteered to help build a new cement roof on their home as a servant evangelism project through HOPE Coffee, Maurico was a bit surprised. However, as the church members talked with the family, they shared that Jesus was the reason why they wanted to help. Soon all of his kids trusted in Jesus! After some hesitation, Mauricio accepted the church’s help, and it wasn’t long before both his and his wife’s hearts began to soften. As the local church members worked alongside his family to complete the roofing project, both he and his wife trusted in Jesus as well! Mauricio has asked for prayer for his neighbors that they would soon see Christ’s love through his family’s newfound faith and trust in Jesus. 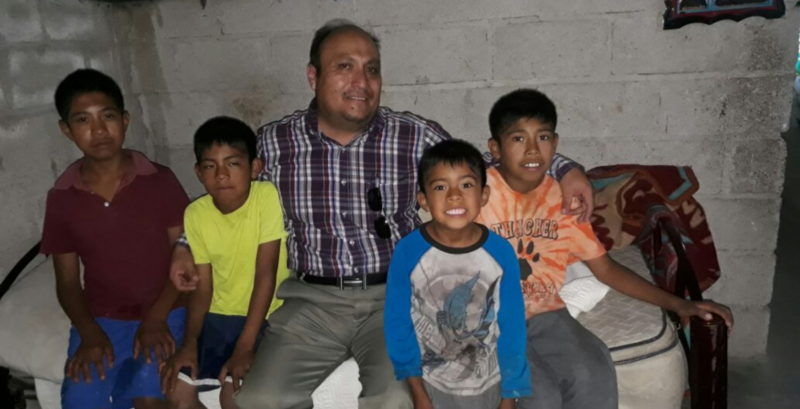 Pictured above: Pastor Ignacio Martinez with Mauricio and Tule’s kids.